Most of cycling’s newest technologies do not interest me. I prefer my bikes single-speed, my socks wool, and my cycling apparel not too flashy. But I have to admit that the new Avanti kit from Descente has me veering out of my old-school rut a little bit. For the rather high asking price of $430, the Avanti outfit — jersey, $190; bib, $240 — ought to be pretty amazing. If you ride where the sun bakes hot, then indeed you’ll likely find this kit special. Using a technology called coldblack (lowercase “c” intended), the material resists sunlight and UV rays. The kicker: coldblack is touted to keep riders as much as 9 degrees (Fahrenheit) cooler when wearing the getup in the sun. The coldblack material is the result of a partnership between Schoeller Technologies AG and Clariant. It’s a textile finishing technology that “prevents textiles from heating up as much and offers reliable protection against UV rays,” the manufacturer says. It achieves this solar protection by working as a sun reflector as well as a UV protector. I tested it this spring and summer. After several months of riding in hot weather, I was pretty sure that the kit was working, but I wanted more evidence. So to really test the kit, I took a cooking thermometer, a timer, and a lawn chair out into the sun. The thermometer was slipped between the fabric and my skin. After sitting unmoving in the sun for several minutes, I was surprised to find that compared to another (also black) kit I wear the Avanti stayed at least 7 to 10 F degrees cooler. This could be a significant boon to those living or racing in hot sunny climes. In addition to keeping cool, the Avanti has a decidedly high-end feel to it. Fabrics feel “techy” and seem durable. Mesh panels add to the cooling effect. Welded edges and lay-flat seems keep things comfy. 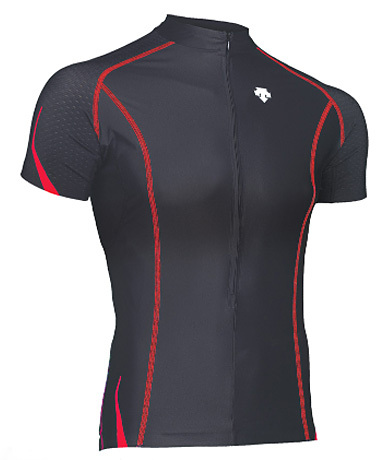 Fit is snug without being tight, and unlike most elastic bottomed jerseys, this one does not ride up on my waist. Available in black with either red or white accents, the kit is mighty handsome. I now often reach for the Avanti when it’s hot outside. Do note that the sizing seems to run small. I wear medium kits, t-shirts, etc. In the Descente, I needed a large. And the kit, while pretty neat, is not necessarily much cooler than a light-colored kit. The benefit is mostly to those who want to wear black but reap the benefits of a lighter color. And the price of admission will keep all but the wealthier or committed riders away. Overall, from the moment I put it on, it was apparent that I was wearing a top-shelf kit. The great fit made me feel faster before I even climbed on the bike. And with help from coldblack, the Avanti has become my favorite summer riding kit, hands down.